Balances and nourishes the skin with organic oils and biodynamic plant extracts. 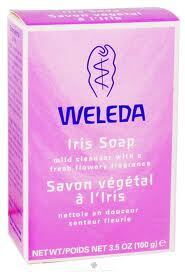 Biodynamic Iris Germanica Root Extract balances, tones and moisturizes the skin. This gentle soap cleanses the skin with a creamy lather from pure oils and soothes the skin with extracts of organic Chamomile Recutita and wild-crafted Pansy. Blissfully refreshing. Sodium Palmate, Sodium Cocoate, Water (Aqua), Sodium Olivate, Glycerin, Fragrance (Parfum)*, Iris Germanica, Linalool*, Geraniol*, Coumarin*, Chamomilla Recutita (Matricaria), Viola Tricolor, Oryza Sativa (Rice), Malt, Lavandula Angustifolia (Lavender), Sodium Chloride.